Reading at Musehouse – Marc Schuster, etc. 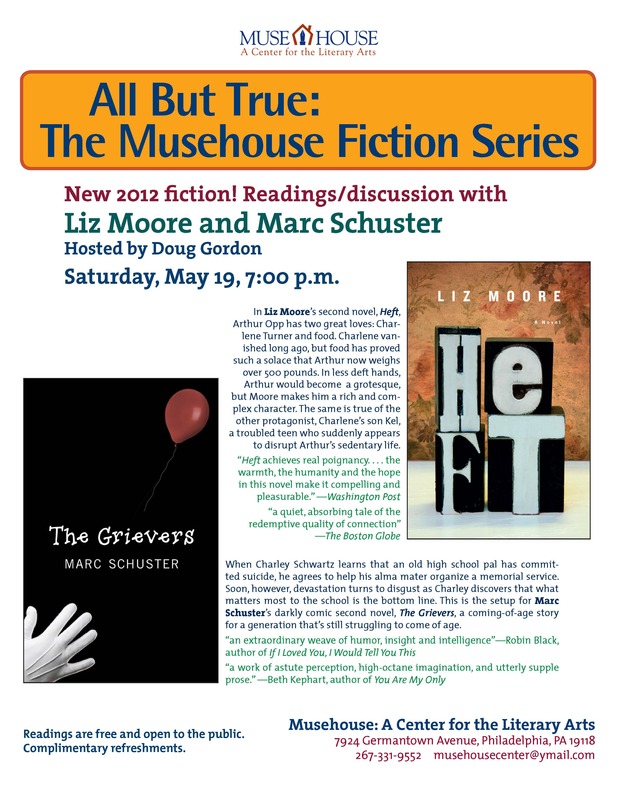 If you’re in the Philadelphia area and looking for something to do on May 19, feel free to drop by Musehouse where I’ll be reading with Liz Moore, author of Heft, as part of the All But True series. I’m also hoping that my video recorder lasts longer than thirty seconds this time around so I can post clips for anyone who can’t make it! Where: Mushouse, 7924 Germantown Ave. Were on that side of the country, I’d stop by! Have a great read, Marc! Thanks! I’m sure you’ll be there in spirit! Wish I was in town! Now that sounds like a brilliant idea! I do so wish I could be there! Extra batteries? Hehe! Have a good one! If I was going to be in your neck of the woods, I’d be there . . . instead, I’ll be reading your book with a drink in hand by a pool in Florida.